From the Introduction, by Jesus: “What I have come to teach now is that you can embody love, as I did. You can become Christ within this human life and learn to embody all that is good within you. I came to show you the beauty of your own soul and what is possible as a human. I came to show you that it is possible to be both human and divine, to be love incarnate. You are equally both. You walk with one foot in the world of form and another in the Formless. This mysterious duality within your being is what this book is about.” "The consciousness that is within me is also within you. You are the son as equally as I am. You are the ‘I am’ I spoke about. You and I are one. You and everyone else are one. Many are ready for the Christ within to come forward and manifest in the world more fully. The birthing of this Christ—of Christ Consciousness—is the true second coming. ‘Christ Consciousness,’ as I am using it, points to the divinity within everyone and the potential for that divinity to become a living reality, to become what lives you. I was an example of that possibility in my lifetime two thousand years ago.” This book was given to Gina Lake by Jesus. It is part of a series of books, including A Heroic Life and The Jesus Trilogy. 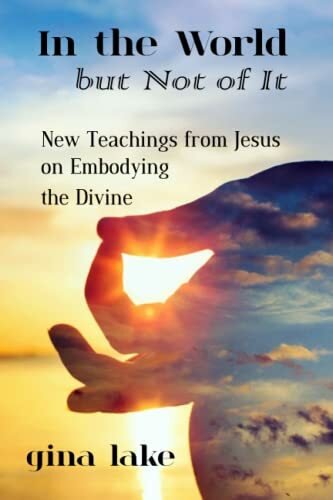 Note from the author: I receive the books from Jesus in the same way that Helen Schucman received A Course in Miracles¸ which is also said to be dictated by Jesus, and which many others have received their writings, including St. Teresa of Avila, St. Hildegard of Bingen, Richard Bach, and Neale Donald Walsch. This method of receiving information is also called conscious channeling, but it is not mediumship in which the channel is unconscious and her body is used by an entity. Conscious channeling, or taking dictation, is a process of hearing words mentally and writing them down as they are heard, without any thought on my part. I can receive this communication anywhere. I don’t need to be in a meditative or trance state. All that is necessary is that I don’t think! When I’m receiving this dictation, it is as if Jesus is sitting in a chair next to me dictating the words, except that those words are heard mentally. I can ask questions during this dictation and receive answers, but the process works best when my own mind is completely set aside. Then the flow happens smoothly and rapidly and without interruption until a particular stopping place is reached. Gina Lake is a nondual spiritual teacher and the author of over twenty books about awakening to one’s true nature. She is also a gifted intuitive and channel with a master's degree in Counseling Psychology and over twenty-five years’ experience supporting people in their spiritual growth. In 2012, Jesus began dictating books through her. These teachings from Jesus are based on universal truth, not on any religion. Her website offers information about her books and online course, a free ebook, a blog, and audio and video recordings.